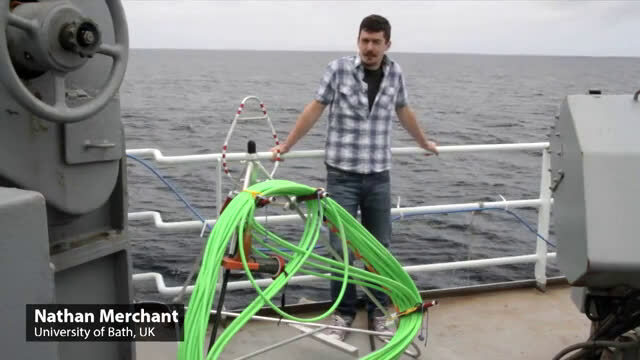 New hydrophones will help researchers track and monitor increased noise levels in the ocean. A PhD student from the Department of Physics who recently returned from a trip to lay microphones on the ocean floor off the west coast of Canada is warning of the dangers to marine life from increased ocean noise. Human-generated noise, predominately caused by shipping, has been rising since at least the 1960s in line with trends in global trade. Now researchers are concerned that this increased noise is masking vocal communication between marine mammals, such as whales and dolphins, limiting the range over which they can communicate. Final year PhD student Nathan Merchant from our Department of Physics was part of the recent mission to install sound recording equipment 2km down on the sea floor, around the Juan de Fuca ridge in the northeast Pacific. This work was part of the NEPTUNE Canada Observatory project, operated by Ocean Networks Canada, which aims to study the ocean using a cabled network that stretches across hundreds of kilometres of the Pacific seafloor. Commenting on his experiences Nathan said: "The main focus of this research cruise was to update and maintain the NEPTUNE Canada Observatory, and also to study deep-sea ecosystems and geophysical structures. For me it was a great opportunity to get first-hand experience of conducting research at sea, and to share ideas with other scientists from around the world. Deep sea science is particularly challenging, as the work is done by a remote-control submersible 2.5 km below the surface – in many ways it's like carrying out a space mission! "As well as collecting samples from the deep sea, we also installed a hydrophone (underwater microphone) on the seabed, which is now recording sound continuously and transmitting the data to shore. The subject of my PhD project is the impact man-made noise may be having on marine life, and this data will allow us to study trends in noise levels in this area, and also to learn more about patterns of acoustic activity such as whale vocalisations and noise from passing ships. Scientists are concerned that noise from shipping may interfere with whale communication, and may increase physiological stress over long periods, affecting health. Studies like this will help us to better manage our impact on these important ecosystems." 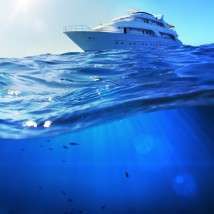 In response to increased levels of noise in the oceans, recent research suggests that marine species may be changing their behaviour; something which could impact on individual survival and population levels. There is also growing evidence to support the idea that climate change will also impact noise levels in the oceans as much of the carbon dioxide linked to global warming is absorbed into sea, causing it to become more acidic. This increased acidity reduces the ocean's ability to absorb sound, meaning global noise levels may rise in line with trends in carbon dioxide levels. With sophisticated recording equipment now in place, scientists can track and monitor such changes over time for local species.